Difference between revisions of "Amane Nishiki"
Amane was made playable in ''[[BlazBlue: Chrono Phantasma]]'', the same game he debuted in. Amane is a tall, thin, androgynous man with light blue eyes and long purple hair tied into a topknot with a pin. Amane is always seen wearing makeup similar to an [https://en.wikipedia.org/wiki/Onnagata onnagata kabuki actor], which matches many aspects of his character and design. "The stage on which the best soldiers are gathered... I wish to dance on such a stage! Such is my wish!" Amane Nishiki (アマネ＝ニシキ), also known as the Uzume, is the current Onlooker of the world. He runs a small troupe consisting of orphans of war that he has adopted, and ventures across the world. He is a mysterious figure, but once he has his eyes set on something, or someone, he wants, it is difficult to dissuade him. 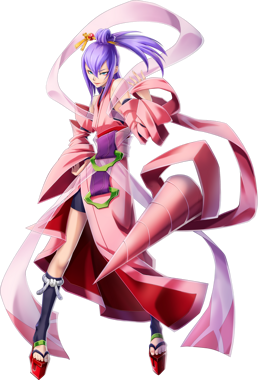 Amane was made playable in BlazBlue: Chrono Phantasma, the same game he debuted in. Amane is a tall, thin, androgynous man with light blue eyes and long purple hair tied into a topknot with a pin. Amane is always seen wearing makeup similar to an onnagata kabuki actor, which matches many aspects of his character and design. He wears a pink sleeveless kimono-like garment with two green metal pieces hanging from the front, black toeless socks, and high platform sandals. He wraps pink scarves around his arms, which he uses as weapons in combat. Underneath his garments, he wears tight black shorts, a short black tank top that covers his upper torso, and black arm warmers. Before entering combat, Amane instead wears a pink, green, purple, and red geisha's outfit with even larger platform shoes. His hair is styled differently, with ten pins stuck in it. Very honest about his own desires, and a dogged and relentless opponent of anything he deems wrong or dishonest. He looks after the boys—mostly war orphans—that he's recruited to his troupe with a great deal of kindness. Straightforward and honest about nearly everything, Amane is true to his beliefs and has an unstoppable determination. When he sees something, or someone, he desires for his troupe, he will never take 'no' for an answer. This can grating, and some people have even tried to runaway from being scouted into the group. When he is not being straightforward, Amane speaks in riddles, dancing around a subject and using various terms associated with performing troupes to mask his intentions. It does not take long for this mask to fall, and then he will tell his victim what he desires from them. Amane cares for those in his troupe as if they were his own family. He's adopted war-orphans, giving them a family, job, and home with him, and goes far out of his way to oppose what he considers an injustice. Nothing fazes Amane - even when someone is holding him by his throat, an aura of cockiness and subtle arrogance in his abilities remains. There are times where Amane makes innocent mistakes and does not notice until a long time afterwards. He once taught Bullet's Mercenary Squad dancing techniques when he mistook them for being a "troupe" instead of "troops"; he did not realise until three days and nights after he had started. This incident scarred Bullet for years because of Amane's harsh dance teaching and regime. As an Onlooker, Amane is far more powerful than his appearance suggests. He is capable of Observing targets, fixing their existence within the world, and can use Phenomenon Intervention should the need ever arise. Because he is an Onlooker, however, he is incapable of intervening on the world and its major events lest he disappear from the world itself. Amane is capable of rebooting the Takamagahara System. As he fights, Amane dances around his opponent, using their own skills and power against them with his grace. In gameplay, he uses the Drive Spiral which turns his ribbons into sharp drills that are capable of piercing shields and guards. For whatever reason, Amane can resist the sorcery spell Slave Red, and is capable of replicating complicated spells like teleportation from just having seen it done once, similar to Vision. His appearance has not changed at all in the last decade, but Amane has denied being outright immortal. Even though he can easily withstand blows from the Six Heroes and even Azrael himself, the true extent of Amane's powers remains a mystery. The beautiful leader of a dance troupe, "Amane." From a young age he wished to grasp the true essence of dance, and obtained the "dance" of battle. He prefers unparallelled "pretty boys," and after hearing rumors of one such young vigilante, he journeyed all the way to the Ikaruga Region to scount him. A pretty young man who leads his own performance troupe. While he carries himself with almost feminine elegance and grace, there is perhaps a darker side that we do not yet know, at least according to Rachel. He takes great pride in the quality of his dance, and fights to master the art of dance. To Amane, the stage and battlefield are but one and the same, and dance and fighting are both arts. Contrary to his appearance, he speaks in a rather crude tone at times, and has a manly personality. His troupe consists mainly of orphans of war, but that does not mean he's not constantly on the lookout for more pretty boys to add to the roster. Hearing rumors of one such child, the Vigilante Carl Clover, he heads to Ikaruga to scout that child, like no child has been scouted before. A young man who leads a dance troupe. He loves the beautiful, and especially beautiful young men. With a personality that honestly pursues his own desires, he earnestly tries to scout pretty boys who catch his eye. The mobile game Mabinogi Duel stars Amane as a playable card. 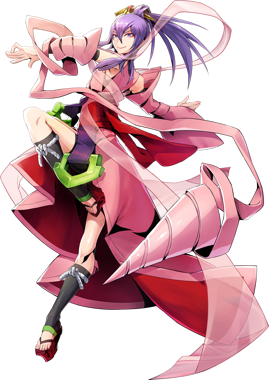 In the BlazBlue 10th Anniversary Character Poll, Amane placed 25th out of the 84 candidates. He scored one place above Kajun Faycott and one place below Kagura Mutsuki. He had 945 votes. The majority of Amane's movelist references Super Sentai. Amane is one of three characters who has never had their Japanese voice actor appear on Blue Radio. The other two are Carl Clover and Valkenhayn R. Hellsing. Amane is the only character introduced in the arcade version of Chrono Phantasma to not have a vocal theme. Amane and Bullet are the only two playable characters who do not appear or are even referenced in canonical side material, including novels and manga.